Arghirescu Marius, Engineer (Dr/Eng. ), patent examiner in the department of substantive examination of OSIM (State Office of Inventions and Trademarks), Romania, in the field of materials engineering (particularly-in metallurgy), with doctorate in the materials science and engineering, also-inventor. 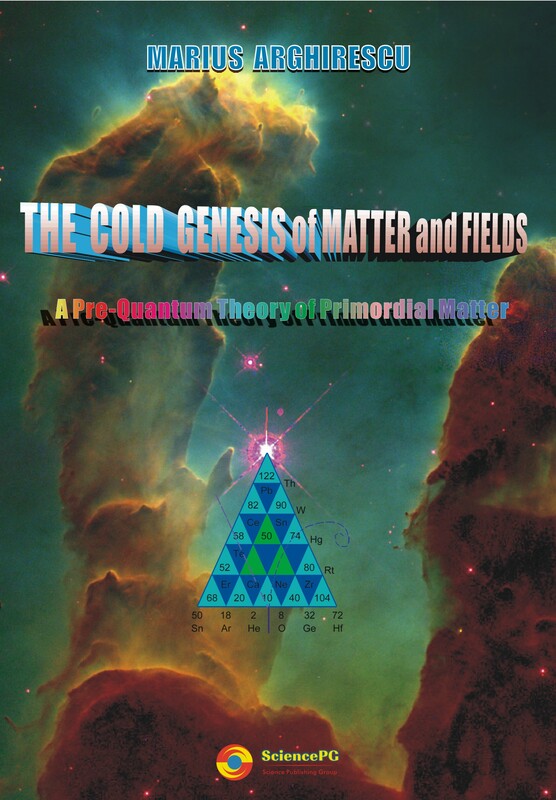 The book is based on a new (original) theory which argues the possibility of a cold genesis of particles and of fundamental fields, in the Protouniverse’s period, by primordial gravistars, using the concept of sub-quantum fluid, explaining the elementary particle and the fundamental fields cold genesis with ideal unitary pre-quantum particle’ models of simple or composite chiral soliton type, formed at T→0K from confined “dark energy” in a cascade vortex process, according to the ideal fluids mechanics applied to the particle soliton vortex. The electro-magnetic and the gravity-static and gravity-dynamic fields are described by an unitary model of charge and by an unitary field equation. The exponential form of the nuclear potential is theoretically found through a mesonic and baryonic model of degenerate electrons and an Eulerian expression, as being generated by the vortexial dynamic pressure inside the nucleonic quantum volume. The weak force is explained by a dynamic model of neutron with intrinsic vibration and the particle disintegration is explained as a result of intrinsic vibration of particles generated by vibrations of current mass quarks formed as B-E condensate cluster of quasi-electrons, by gammons confining in very strong magnetic field, of a gravistar or a magnetar star. For a phenomenological model of cosmic expansion, by the dependency of the G-gravitation constant on the etheronic local density, the physical cause of the cosmic expansion results as a force of pressure difference of etheronic winds coming from the ultrahot stellary structures having an antigravitic charge given by destroyed particles, the speed of expansion resulting with a semi-sinusoidal variation. The theory can explain also phenomenological, some known specific effects, like the magneto-electric and the magneto-mechanic effects.